Amazon.com (AMZN) CEO Jeff Bezos continues his ambitious expansion into the media world with plans to launch a new Prime music streaming service later this year. The launch creates a new layer of competition for a crowded business topped by firms like Alphabet (GOOGL), Apple (APPL), Pandora (P), and Spotify. For artists and musicians €” and individuals who own music royalties and copyrights €” Amazon's entry into the industry will be another positive step in ensuring proper compensation in the music industry. Amazon has already established itself as a major competitor to Netflix's (NFLX) streaming video service and has launched a reputable production house that has created successful shows like The Man in the High Castle, Bosch, and Transparent. The firm has long had a streaming service embedded within its annual Amazon Prime subscription. However, the new platform will be a standalone product, priced monthly, that will aim to rival the 30-million-song catalogs of competitors like Apple and Spotify. It will also integrate its Amazon's Echo voice-powered tower, which has already provided hands-free integration of music services from rivals Spotify, Pandora, Apple and others. Its virtual assistant Alexa streams songs from Spotify on demand, a tool that Amazon will expand in its premium offering. More competition is by default better for both consumers and for artists. And it's poised to help liberalize the royalty business at a great time for investors. Amazon.com is doubling down on the music industry in 2016, and for good reason. The music business is currently undergoing a sharp reversal in its revenues, and the widespread adoption of subscription-based streaming services is poised to be a boon for the sector. Since the mid-1990s, music industry revenues have decreased steadily as technological changes pushed music lovers from cassette tapes to compact discs to MP3s and now to streaming applications on devices like phones and tablets. During that time, the sector saw a hefty revenue decline through 2015. Part of that decline came from the advent of free-streaming services that set wrongful expectations that music should be free. Credit Suisse projects that paid streaming will help generate immense revenues for the music industry in the future. As Credit Suisse explains, revenues will revert back to 2008 levels by mid-2017 and surge toward the end of the decade. That growth fueled by a surge in paid-streaming services like the one set to be launched by Amazon this year. Simply put, the industry is taking great lengths to curb piracy and free ad-based platforms that provide lackluster payments to artists. For example, a roster of power players in the industry are calling for changes to the free ad-based model of YouTube, which pays significantly less in royalties than other music platforms, but accounts for a staggering 40% of music consumption in the United States today, but just 4% of the total revenue, according to Apple Music executive Jimmy Iovine. Musicians have taken on similar streaming providers in the past like Spotify and won higher royalty fees. The industry should win its battle against YouTube, which relies on the industry for the bulk of its content - whether or not music is uploaded with the copyright holder's permission. 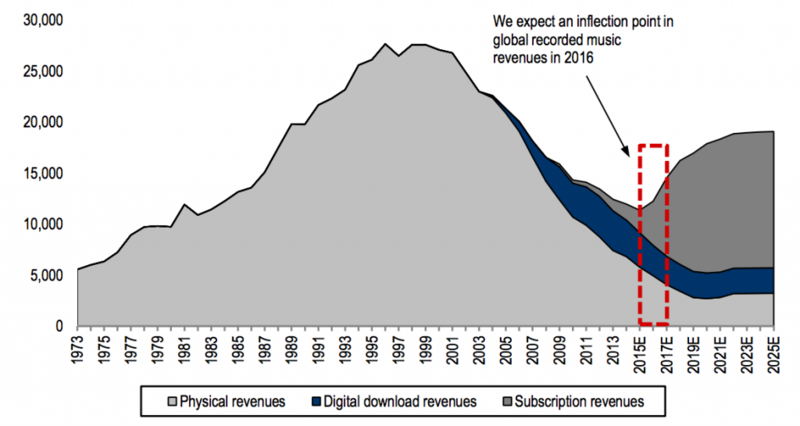 Credit Suisse projected back in April that Apple will control a whopping 45% of the paid music streaming industry. But the addition of a behemoth to the streaming business like Amazon will boost competition for consumers and compensation for musicians. It provides another place where musicians may find exclusive deals that offer higher pay for their music, and places pressure on competitors to improve royalty terms so that content can be broadcasted on their platforms. Competition among streaming competitors will foster greater royalty streams for artists and holders of intellectual property. This is important for investors considering the purchase of intellectual property within the music business. You see, every time that a song is played, downloaded, sampled and streamed, the owner of that intellectual property receives direct payment in the form of a royalty. Royalties are even paid when songs are used in personal videos, mash-ups, and even public events. And though revenues from vinyl, CDs, and other physical sources will continue to decline, the paid-streaming services surge will fuel a rapid industry recovery through the end of the decade. Music royalties as an alternative asset class can provide investors with strong, reliable income streams for decades at a time that a streaming renaissance is set for the music business. This is just the beginning of a major turnaround, and investors looking for alpha should consider royalties as an investment. The best way to get access to these royalty streams is to learn about the current auctions and listings of available through Royalty Exchange, the premiere platform for the buying and selling of these alternative assets for investors and artists. If you want to learn more about royalties and intellectual property available for purchase right now, learn more here at Royalty Exchange.